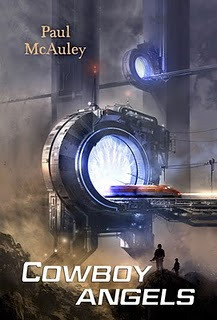 Hey, the new Pyr catalogue is out, so now I can tell you that Cowboy Angels will be published in the US of A in January 2011. The fabulous cover - my third by him - with a train exiting a Turing gate, is by Sparth. The retro lettering is great, too, and entirely appropriate: the novel is set in the 1980s, in a variety of Americas.